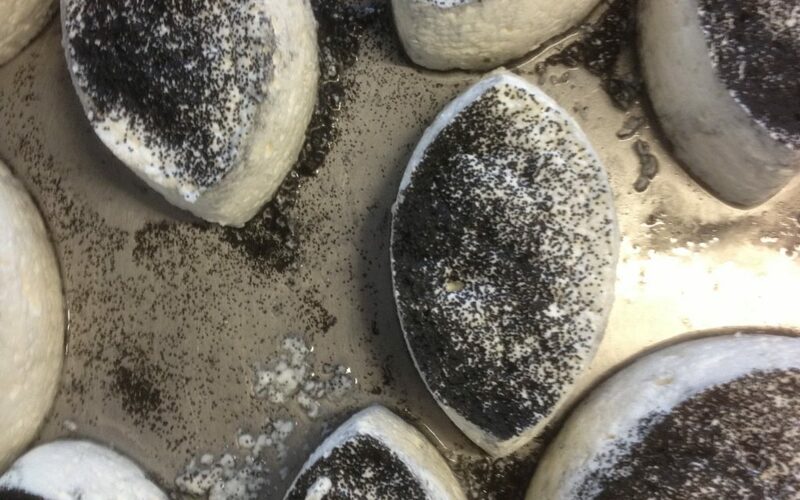 Fresh Gour Noir Cheeses, 2013. Photo: Chris Fite-Wassilak. During your Politics of Food residency you’ve been developing a longform essay. What ideas are you working through with this piece? 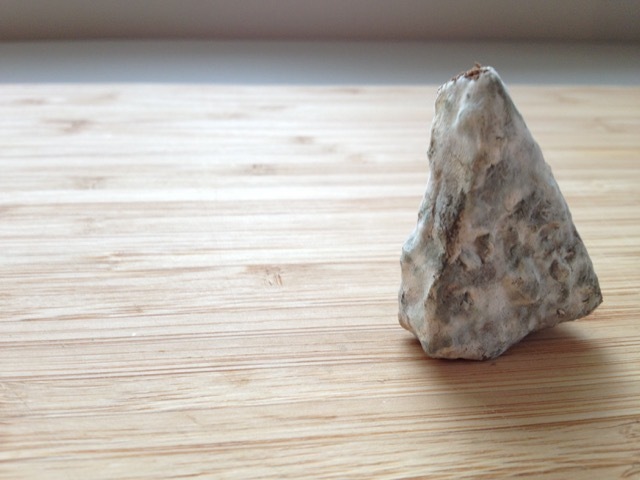 I’ve been thinking about an essay around cheese for way too long; for a while I was looking at attitudes towards hygiene, and how people usually decide whether they like something or not — particularly a food like cheese, which is off milk mediated by bacteria and yeasts — before they’ve even eaten it. But I also want to find away to talk about production methods, how the desires that went into making a food might also reflect off that decision and self-projection that goes into eating something. Eventually, it filtered through my head into an idea of contrasting two specific meals, one with a farmer near Egletons, France and the other with my extended family in St. Louis, USA, and looking at two specific cheeses that were part of each meal: an unpasteurised goats’ cheese called Gour Noir, and Provel, an industrial process cheese. The essay is an attempt to think about how we each mediate and internalise these quite large and interconnected issues of production and consumption; we might moralise and look at environmental and health benefits, but also sometimes emotionally we eat for different reasons. Your major culinary focus is on cheese, what is it about cheese that, for you, encapsulates current political concerns? Cheese an ancient food technology that manages to hold a dense tangle of human history within it; in it’s simplest form, it’s working with spoilage and microorganisms to turn milk — the first food we eat as babies — into something that is transportable and nutritious. But in many of the forms we encounter it today — think of a pure, orange rectangle of cheddar from the supermarket — it’s a highly processed mass that consists of milk solids mixed with flavourings and other chemicals that attempt to replace what might normally happen during maturation. Farmhouse cheeses, where the dairy farmer also makes the cheese, reflect a directness and independence that many of us idealise, but few of us — or, at least, city folk like me — could actually hack; while industrially produced cheeses are highly controlled forms designed for long shelf life, maximum profit — and still form the majority of what we, as urban dwellers, choose to eat. If it wasn’t profitable, it wouldn’t be made. How do we, in the current urban majority, actually support real food production without also casting rural life as a sort of idealised, but somehow lesser, other? VQR Vassiviere Affinage, 2013. Photo: Chris Fite-Wassilak. You’ve said that you’re interested in dissolving some of the widely accepted boundaries of food discourse — the ideas of authenticity and gourmet ingredients. A lot of what we normally buy is dolled up within the rhetoric of authenticity — though often it’s almost like Derrida’s ‘deconstruction’ game; if you think about what the opposite of the word, that’s often exactly how that thing was produced (eg, fresh, homemade, local, and so on). But that’s an obvious point; companies will always be brand managing. What I find more interesting is the grey areas and the internalised acceptances, like how unpasteurised milk is not just classified as a ‘biohazard’ in many countries, but commonly accepted as dangerous, and how factory production has been normalised accepted as the safer, cleaner method (one old friend compared drinking unpasteurised milk to driving without a seatbelt on). Industrial methods also permeate smaller farms; in, say, chemically produced rennet, processed feeds for the animals, ash for rinds made from synthetic carotene. It can be seen along the lines of what form of labour do we value enough to support by buying its outcomes, but where do we draw the lines? Which isn’t to say to just give up and buy Easi-singles, which themselves have been having a resurgence simply as part of an ‘authentic’ American burger — aesthetics and facility win over taste and production method yet again — but to consciously engage in those contradictions to feel out where to go from there. Have you found your writing and research complemented by the work of any of the artists currently in residence? It’s been great to think through ideas of narrative, idealisation and transmission with the other residents, as these seem to be common issues that we are dealing with in different ways. Different foodstuffs become embodied histories and metaphors, that can remind of a lost past or be recovered or re-shaped.